Cooking BBQ.. Pakistani/ Indian style! The main ingredients that go into a BBQ are smoke and a lot of fire.. But when you’re Asian, like me.. You need SPICE IN YOUR LIFE! And I don’t mean baby, posh, sporty, scary and ginger! We made a large variety of BBQ and I’ll give you a run down of the spice we used, as well as some stations which I think would taste good! for about 5 mins each side until gorgeous and sizzling! 2.) Chicken tikkas! Exactly same way! In fact.. The boneless chicken was also done the same way! instead of adding the cumin though! We added black pepper for flavour! The chicken was BEAUTIFUL! Especially the whole chicken because it was soft and moist when we ate it! I would add around 5-6 lemons to the chicken though because it picks up the flavour better! Also, a good sauce on the side or chicken gives a lot of flavour! 3.) Kebabs! The spices used were chilli powder, cumin, turmeric, chaat masala! Chop up some very finely cut coriander and onion in their too! Add some garlic and ginger paste and allow your nose buds to go wild! 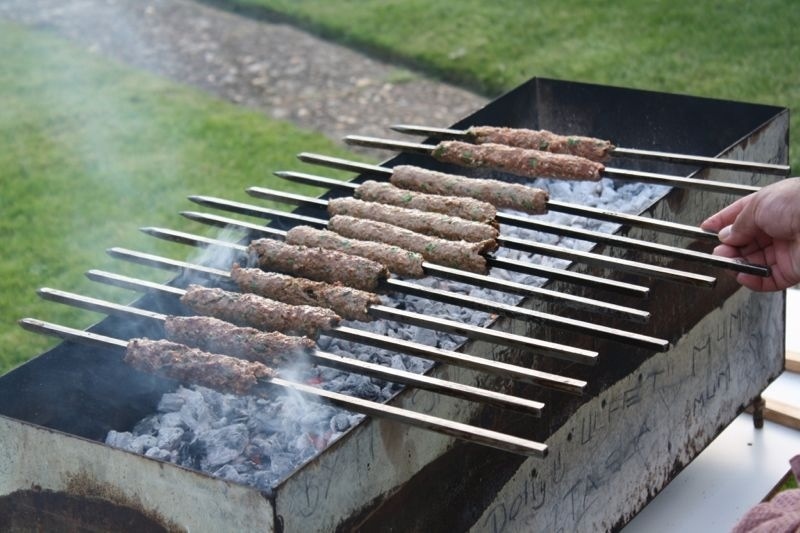 Grab a skewer, roll the meat around and it and you have a yummy kebab! No measurements because it’s best if you add to your taste! I like them REALLY spicy! For about 1 kilo of meat, I would use more than 1 tablespoon of each spice! That’s far too much for some people! 4.) The prawns were pre cooked because they were already pink when they were bought! 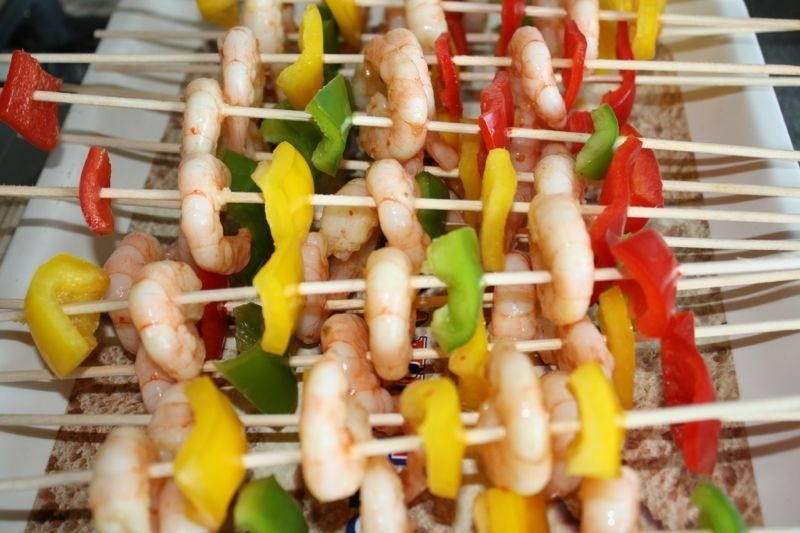 We chopped up some peppers (Red and yellow) and we just alternated between prawn and pepper on the skewer! We allowed the pepper to burn a little and it tasted GORGEOUS! Literally like 3 minutes, changing the side every now and again! Nando’s Peri Peri sauce.. and WHAM BHAM THANK YOU MA’AM! 6.) The sauces! Grab some fresh mint and grind this until like purée! Add some whole green chillies and salt to taste and mix with yoghurt! This makes an amazing sauce with chicken and lamb! 7.) For drinks we made Mojitos! 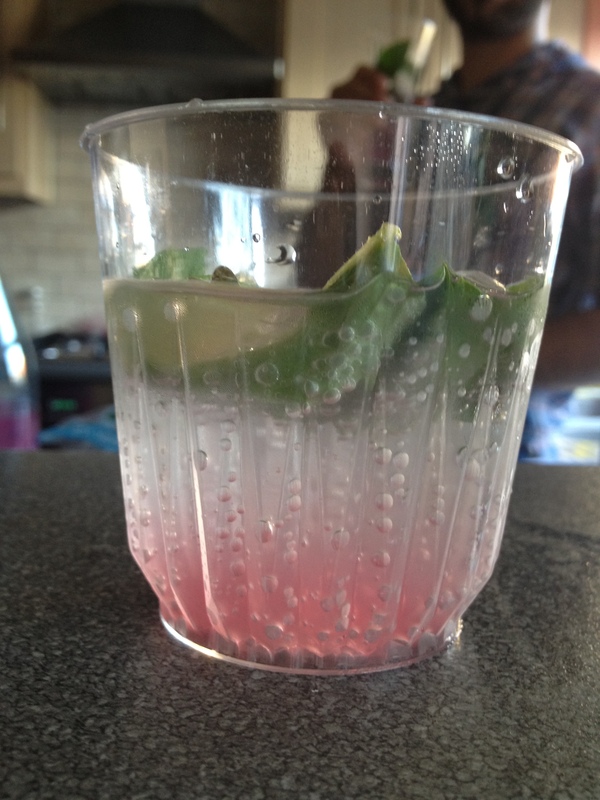 We got some fresh mint, crushed ice and some flavoured soda water which we poured over the ice and mint and added a small slice of lime! Why added over??? 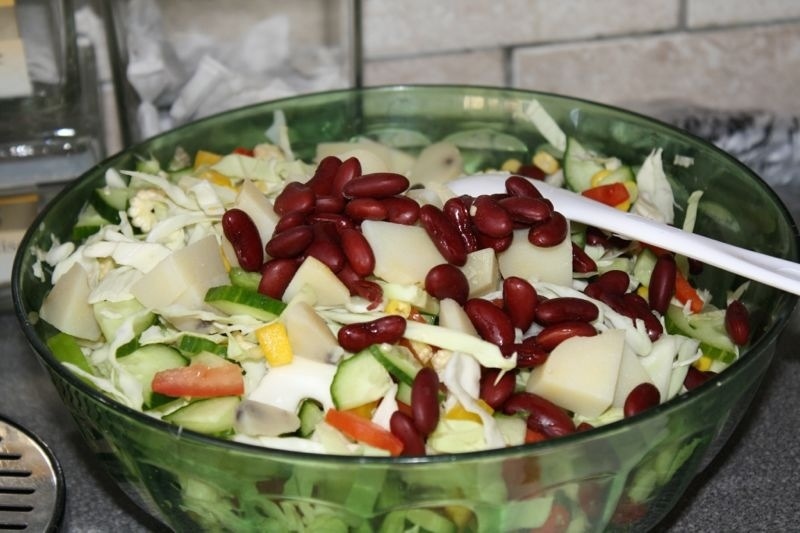 We found the flavours were stronger and had a bite this way and kept us refreshed ALL DAY!